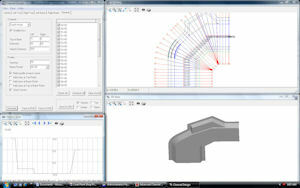 o CHANNEL DESIGN automatically creates planned lines and cross sectional profiles for channels and turning basins. o ADVANCED CHANNEL DESIGN creates complex 3D surfaces for precise dredging and volume computations. HYPACK� automatically stores your survey information to a project directory, allowing you to quickly load previous surveys. It runs under Windows XP� and Windows Vista�.HYSWEEP� is an optional module that provides for the calibration, data collection and data processing of multibeam sonar data inside the HYPACK� package. HYSWEEP� has been integrated to almost all multibeam systems, including those from Odom, Reson, Konigsberg/Simrad, Elac/Seabeam, and GeoAcoustics. With over 500 HYSWEEP� users on six continents, HYSWEEP� has proven to be powerful, cost effect and easy to learn. Although software packages provided by multibeam manufacturers might be great at data collection, they are usually weak when it comes to generating final products. What�s great about HYSWEEP� is that it is fully integrated into HYPACK�, allowing you access to all of the great final product routines, including volume computations using your multibeam data.REDGEPACK� is designed to save you money. It keeps your crew working in the dredge cut and prevents them from wasting time and money by digging too deep or outside the channel. DREDGEPACK� is designed to work with cutter suction, hopper, bucket and excavator operations. Using tools in DREDGEPACK�, your SURVEY data is loaded into a color coded matrix. Your survey data can come from single beam data, multibeam data or multiple transducer data. DREDGEPACK� will monitor the exact position and depth of the digging tool and keep track of an �As Dredged� surface. You�ll be able to see exactly where your digging tool is in plan view and in profile view. You�ll also be able to see the channel design depth and channel overdepth in profile view. For a cutter suction dredge, typical inputs to DREDGEPACK� are a directional DGPS and an inclinometer to determine the angle of the ladder arm. DREDGEPACK� integrates to several commercially available inclinometers, or can read existing equipment using OPC Network interfaces or analog/digital cards.